An underrated but really good Bible dictionary is the New Interpreter’s Dictionary of the Bible (NIDB). Published by Abingdon, the five-volume set is edited by Katharine Doob Sakenfeld and includes contributions of nearly 1,000 scholars. For a short time the dictionary set is $99.99 in Olive Tree Bible software. Below I offer–from my perspective as a preaching pastor and Bible reader–my take on the set, with a focus on Olive Tree’s iOS Bible Study App. There are more than 7,000 articles in NIDB. The contributing scholars are diverse in terms of gender, ethnicity, and denominational background–a refreshing mix of voices. The dictionary balances reverence for the biblical text with rigorous scholarship–though the dictionary is rarely arcane. While the verb may involve coercive activities in interhuman relationships (see Num. 32:22, 29), no enemies are in view here–and this is the only context in which the verb applies to nonhuman creatures. This sort of blend between technical detail and pastoral application is present throughout the dictionary. The 4th-cent. 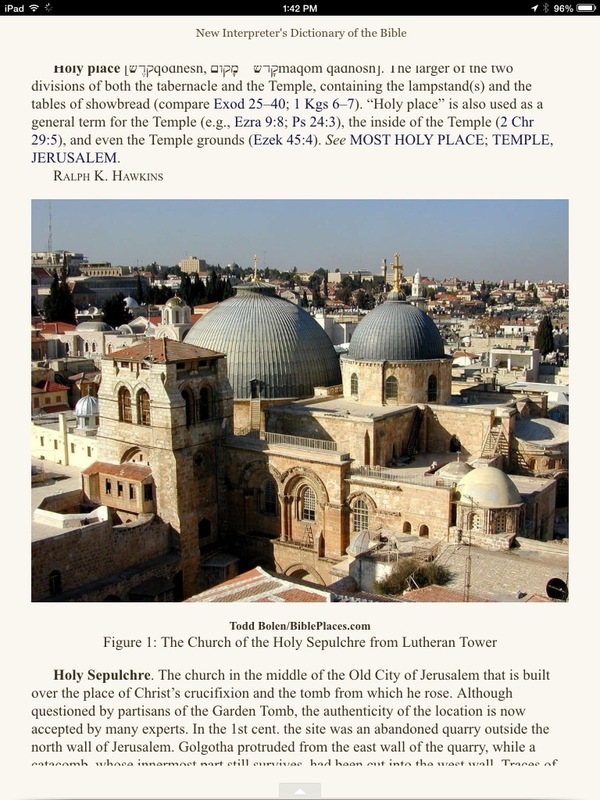 CE “Codex Vaticanus” contains all of the books of the Hebrew Scripture or Protestant OT, and the following material that is today classified as deuterocanonical: 1 Esdras, 2 Esdras, Ps 151, the Wisdom of Solomon, Ecclesiasticus or Ben Sirach, the additions to Esther (several of which were originally composed in a Semitic language; others of which are original Greek compositions), Judith, Tobit, Baruch, the Letter of Jeremiah, and the additions to Daniel (Azariah and the Three Jews, Susanna, and Bel and the Dragon). The entry goes on to describe other Septuagint manuscripts, with hyperlinks in Olive Tree to related entries. 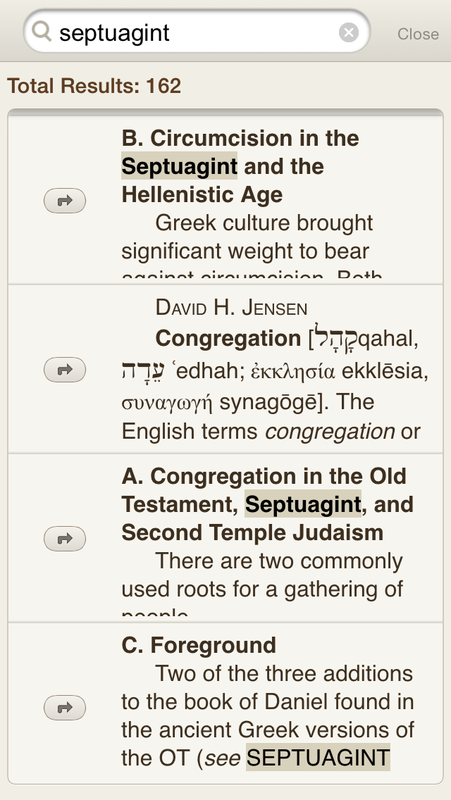 Olive Tree is as cross-platform as a Bible study app gets: it runs on iOS (iPhone and iPad), Mac, Windows, and Android. The app itself is free, and you can get some good texts free, too, so you can preview the app before you buy any resources in it. I’ve got the Olive Tree app on Mac, iPhone, and iPad Mini. It’s one of the best-executed iOS Bible study apps I’ve seen. It is visually appealing, highly customizable (especially with gestures and swipes), and easy to learn. You can navigate with “flick scrolling” (how iBooks is set up) or “page scrolling” (like Kindle). This will make just about any user feel at home in the app. Flick scrolling (how you’d navigate a Web page) feels more natural to me, so I use that. Then I can select a result and read the given entry. The full-color photos are zoomable. The NIDB contains full-color photographs that help visualize various entries. You can select the photograph and pinch-zoom for more detail. Two-finger swipe left and right takes you through your history within the app. 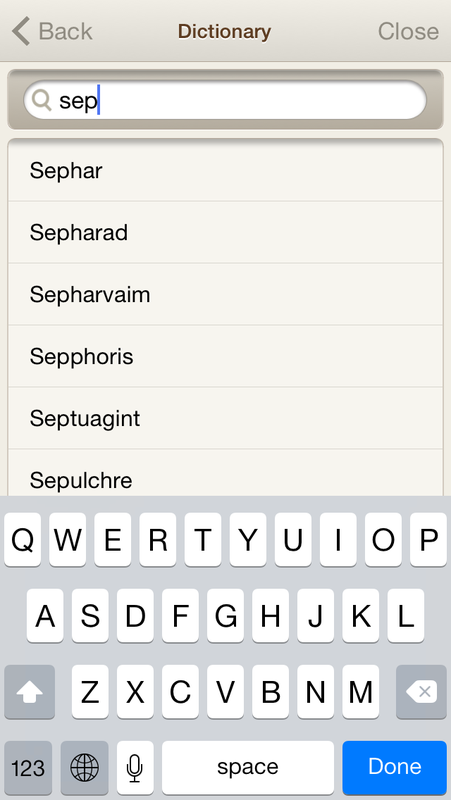 I can swipe between NIDB, and the last NIV Old Testament passage I was reading, and a commentary, and…. No need to go through menus. Two-finger tap gets you from any screen to your library; right away you can get at your other resources. One of my favorite features of Olive Tree’s apps is that you can view two resources at once that aren’t tied together by Bible verse. It’s like having split windows on an iPad. So you can have the NIDB open in the top half of your screen, and a Bible text or other resource open in the bottom half–even to unrelated topics if you want. The New Interpreter’s Dictionary of the Bible is about as good a Bible dictionary as you’ll find. If you can use it to complement the Anchor Bible Dictionary (also available in OT), you’d be very well set with Bible dictionaries. Olive Tree has done a great job, especially with its iOS apps. As much as I loved my print copy of NIDB, I unloaded it not long ago since I can essentially carry it around with me now. And getting at its contents is even easier with the enhancements Olive Tree provides. Thanks to Olive Tree for the NIDB for the purposes of this review, offered without any expectations as to the content of the review. You can find the product here, where it is currently on sale for $99.99.